The Ambassador of Nigeria in Japan, Professor Mohammed Gana Yisa, has assured that the Embassy of Nigeria in the country will work assiduously to ensure that Nigerian Team record a successful outing at the 2020 Olympics in Tokyo. The Ambassador with the Hon. Minister & NOC President. He gave this assurance when he received the Honourable Minister of Youth and Sports, Barrister Solomon Dalung, in the Embassy earlier this week. In his response, the Honourable Minister expressed gratitude to the Ambassador for the assurance. He described the Embassy as the “eye” of the Nigerian Government in Japan and noted that as the Ministry of Youth and Sports prepares for the 2020 Olympics, they would continue to rely on the counsel of the Mission to guide the Ministry on logistics, welfare and other relevant issues. 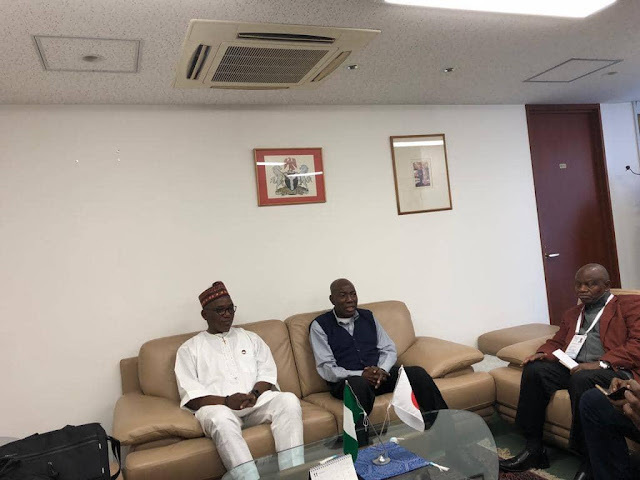 While in Tokyo, the Honourable Minister inspected the sites and the facilities under construction in preparation for Tokyo 2020 Olympic Games, including the facilities in the likely camping sites for the Nigerian Team for the pre-Olympic training. He also attended the XXIII ANOC (Association of National Olympic Committees) General Assembly tagged TOKYO 2018. The Honourable Minister, who arrived Tokyo on Saturday 24th of November, returned to Abuja on Wednesday 28th. He was accompanied to Tokyo by the President of the Nigerian Olympic Committee, (NOC), Engr Habu Gumel and some officials of the Federal Ministry of Youth and Sports. The 2020 Summer Olympics, officially known as the Games of the XXXII Olympiad and commonly known as Tokyo 2020, is an international multi-sport event scheduled for 24th July to 9th August 2020. The government of Japan has been working round the clock in preparations to host the events. Recently, on Saturday 24th of November 2018, Japan’s Prime Minister, Shinzo Abe and the President of the International Olympic Committee (IOC), Thomas Bach, paid a joint-visit to the Fukushima Azuma Baseball Stadium to inspect the Olympic Baseball and Softball venue. It would be recalled that on 7th of September, 2013, after two rounds of voting during the 125th IOC Session in Buenos Aires, Argentina, the IOC awarded the Games of the XXXII Olympiad in 2020 to Tokyo. The other Candidate Cities during the voting were Istanbul in Turkey and Madrid in Spain.